The year was 1670, According to the calendar that the demographic of the day chose to ascribe themselves to. The Lucasian professor of mathematics at Trinity college, Cambridge, walked out into the fresh, cold air, breathing deep to soothe his nerves. He had delivered yet one more lecture to a crowded class, filled with kids all obsessed with showing how intelligent they were, how full of understanding of the world’s inner, deeper concepts. Smatterers. How he abhorred them. But in the very least, all that was over, and the entire chattering bunch of imbeciles had dispersed at the end of their Michaelmas term, to go back to their happy lives and their happy families and whatever hole they had come out of. Not that he particularly cared about any of them. He would finally get some days of his own. The professor swung his legs out of bed, awash with the first rays of the morning sun, the perfect morning, a divine occurrence. He dared not open his eyes, for that would mean accepting reality again. Vainly, he sought to preserve his foothold in the magnificent world of surreal projections that he had inhabited in the hours of nightfall, the world of logic beyond logicality, and of such clarity of thought that his breath was swept away. Hours upon hours upon hours he could ruminate upon the intricacies of a merely mathematical problem when in an instant, the uberwurld offered answers, revelations, epiphanies that were out of reach of the mere mortal mind. He thought back, upon his ruminations of King Solomon’s temple, built by another like himself, with messages in its arches, its spires, and conic sections that were visible only to another of their sacred coven, only to him. And yet, as is wont to happen with all that tends to be in a state of motive inertia, he could not sit forever as he was. Reluctantly, he opened his eyes, and waited for his pupils to dilate and adjust to focus the scene in front of him. Naught did he know, as did the other people of his time, that this hypersensitivity to light was the first signs of mercury poisoning that he was beginning to exhibit, effects, perhaps, from his ministrations of the night afore, and the ones before that. Dimly, the first thing that he noticed was his full chamberpot, and that its depth seemed less that what it ought to have been. Of course. That much was obvious, but why did that happen? Why, the light hitting the waterś surface got bent, of course, at the point whereupon contact was established. Struck by the absolute simplicity of what he had just realised, and its implications, that this must be true for any any two transparent surfaces, he reached for his bedpost with an agility surprising of one so frail, and hoisted himself upright. Tottering to the writing stand, he picked up his quill, for he was one of the people who still preferred using one, and wet it with his tongue before dipping it in the bluish-black ink in front of him. And began to write. It had been an year and a half since that day, and the nature and properties of light still held a grip over his waking hours in the manner of a greedy toddler towards a sugar candy. It had a divine role, one he had been chosen to fill, for after all, the interpretation of sacred knowledge was not everyone’s cup of tea. He had, more or less singlehandedly, constructed what he called a reflecting telescope, an instrument so unique that Royal Society asked to be shown on. 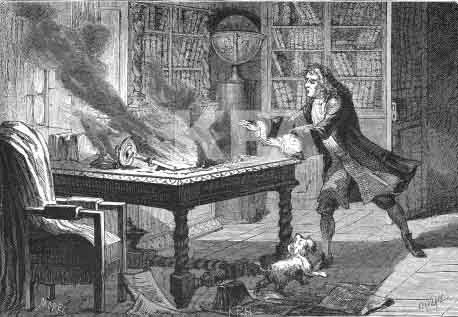 He had ground his own mirrors and lenses, and used a method of his own to judge their quality, what would later be known as Newton’s rings. But all this mattered not, for he had discovered something much more fundamental. Light, pure light, was not pure, but an iridescent mixture of every colour known to man, and those that he even dared not venture into putting into words. And yet, with the aid of nothing but a triangular piece of glass, this duplicity of light could be unmasked, brought before all to see. And these colours, once separated, stay unique, unchanging, regardless of how he manipulated them. The world around him had changed. Objects, everyday objects, that he, and everyone else, had taken for granted, were not of those naturally occurring colours as he had earlier presumed,rather, it was only their interaction with the objects around them that they assumed the pretense of colour. The world was not what it was, merely a play of light, of shadows, of conniving chromatic aberrations hiding their infinite wisdom from the common peasant. And he meant to figure out why. He took one last look at the Diana tree upon his windowsill, a wondrous creation of arising from mercury in a solution of sliver nitrate, a tree, nonetheless, that was proof of the fact that creation was in man’s will, all it required was a push. A push rather akin to what he was about to do now. He looked up. At the clear sky, cornflower blue, cloudless, a bird or two. And at its summit of its journey across, the sun. He looked at the sun, the sun stared back, white light personified. A veritable spectrum inherent in its every ray. As his pupils contracted and every impulse in his body tried to make him veer away, or at least close his eyes, the sun began to dance in front of him, searing white, one moment, pitch black the next, and yet, no matter how hard he tried, the colours just wouldn’t separate, wouldn’t reveal their secrets. Maybe he wasn’t one of them, one of the people destined to receive the sacred knowledge. Maybe he was no one, a play of light conjured to relieve his consciousness of its foolish sentimentality towards physical existence. And that was the last thought he had, before the shock drove out the last dregs of his willpower and he crouched low, under his windowsill, holding his eyes and sobbing lightly. A week had passed, and the darkness hadn’t lifted. Initially he had borne it akin to a divine penance, but then it seemed like his vision would never come back. His other senses made themselves felt, but to no avail. Smell, sound, touch, they were all useless to him if he couldn’t see. How else could he perceive nature, or was that his punishment, that he had tried to unravel what should have been left alone, worshipped, not deciphered. Maybe there no trinity, after all. He appealed to ariane, futilely, for light, where no light was forthcoming. His withdrawal needed naught a description. He was just so extremely sad, it hurt. It has taken over everything else, driving out all the other emotions, all feelings, thoughts and cognitive action out of his mind like so much dross. Now there was only sadness, deep, encompassing sadness, and its brother, pain. He didn’t notice the pain, initially. maybe because it wasn’t there. maybe because he was simply too engrossed with feeling sad. whatever. But then it hit him, like a physical wave. Pain was the liquid that could find every chink in his armor. ever nook and unprotected cranny that his mind and body possesses, and then drive against it with a battering ram until it widens, gapes, and finally caves beneath the barrage of suffering, and fear and pain, and there exists naught else in the world at point, and the only thing he prayed for, is that it goes away. It all goes away. And then it’s gone. replaced by a vacuum. Newton regained his sight after about a month, and went on to do most of the illustrious work that the world remembers him for today. Maybe this incident changed his viewpoint towards the universe. Maybe it didn’t. We can only conjecture. This is from a rather popular book, written a few hundred years after the incident. “Newton was a decidedly odd figure—brilliant beyond measure, but solitary, joyless, prickly to the point of paranoia, famously distracted (upon swinging his feet out of bed in the morning he would reportedly sometimes sit for hours, immobilized by the sudden rush of thoughts to his head), and capable of the most riveting strangeness. He built his own laboratory, the first at Cambridge, but then engaged in the most bizarre experiments." This work depicts only the sole opinion of the author as to Issac Newton’s nature, and neither endorses nor rejects it. The factuality of the incidents reported in this piece of fiction is more or less accurate, with links and citations available to confirm them.